The pinya is the base of the castell. The larger the pinya, the more stable and safe the castell will be. By the same token, the larger the pinya, the taller the castell will be. The vast majority of castellers don’t climb up the castell, in fact. They are in the pinya. They “fan pinya”. And it’s the only part of the castell where everybody, casteller or not, can join in. “Fer pinya” in catalan means “to join together for a common objective”. In the pinya, it doesn’t matter your age, your social status, your race, your educational level. Nothing matters but your will to join into the pinya and help to raise the castell. Castellers setting up for a pinya. For what you could see in the image, I think you may bet that the pinya is just a tumult of people, like if they were placed elsewhere only for the sake of some stupid guy. Well. Not exactly. Let’s take a look closer and from above. The pinya ready for a “4”. This is the very center of the pinya. These castellers are setting up a pinya for a “castell de 4”, this is, that in every story there will be four castellers. One day, again, I will explain deeply the different castells and what is the difference between them and the difficulty, and on. You already have seen in the picture at the top, that the people at the front row of the pinya (the so-called “primeres mans”, or “first hands in English) has to grab the thighs, the legs and the bums (yes. Bums. 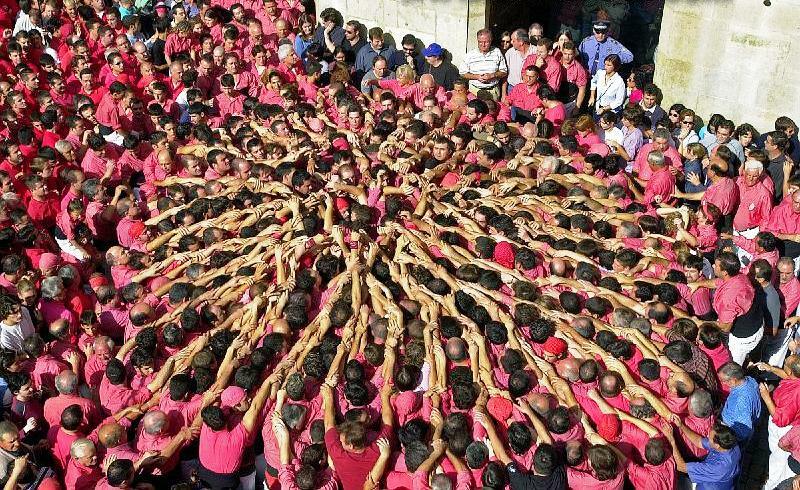 We’ll talk one day about the sexual connotations of Castells. I add it on the list) of the “segons” (seconds). These are the different parts of a Castell. Well, again. That structure is for a structure of four castellers in every story. We can see it because there are four main lines of people, like a cross. These people are in a “rengla”, and they will handle most of the weight of the castell. Each of these rengles will handle the weight of each pillar of the castell. Then, you can notice that there are another four main lines in saltire. These are called “vents” (in English means “winds”) or “mà i mà” (or “hand and hand”). They are called so because the primeres mans have to keep the distance between pillars. And of course, has to handle the weight. But castells, and especially the pinya, are a “force zero” field. Physics applied: the more weight comes to you, the same force you have to apply while you are in a pinya. 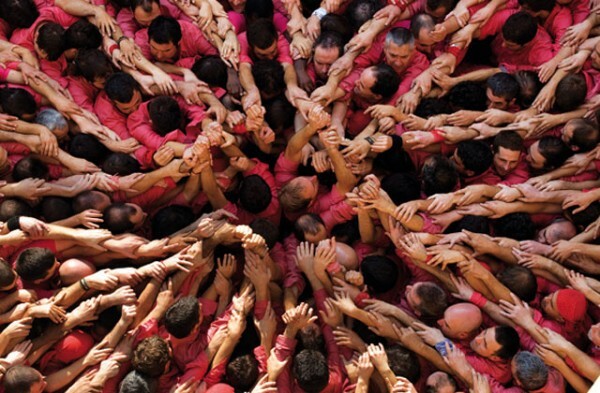 To do this, castellers in the pinya “donen pit”, “to give chest”, to balance the force that comes from the castell. While in a pinya, your chest will be touching the back of the person in front of you. And the person who’s back to you will be touching your back with your chest. To be in the pinya you need to be able to stay several minutes completely blocked, surrounded by people you may not know. Sweating and sharing the suede with the people surrounding, and even maybe getting stepped on by the castellers who are going to climb up the “tronc”. Yes, castells have a lot of physical contact, so I’m afraid that they are not suitable for those people who suffer from claustrophobia. But I can assure you that the feeling of comunion is captivating. I can’t say it in words, unfortunately. Previous PostWhat is a “colla”?Next PostWhat are a “Gralla” and a “Tabal”, and what are they used for? La imatge que has posat de les parts del castell no és d’un quatre com hi dius al text, sinó d’un 3.